as always, click on photos to enlarge! As I delve deeper and deeper into Paladins I have made the leap from casual Paladins player to forum poster. Forum poster started off fine, but has since graduated to game defender, common sense freedom fighter, and general anti-anger enthusiast. Boy, did I get sucked in. I am not sure what drove me to go to the forums in the first place but there I was, filling out a profile, selecting an avatar, and combing through the various sections on the boards. They make you use your in game name as your forum name so cross referencing games and performance is quite easy. This builds some semblance of justification of opinion (oh, you are complaining about Bomb King? I have 250 wins as BK! Look at my stats!) but in truth I appreciate it because it removes a small layer of anonymity that often fuels negative behaviour online. When it’s harder to hide who you are, it’s harder to act differently than you do “in real life”. The fact that escapes so many on message boards / twitter / facebook (etc.) still shocks me. Especially on platforms that don’t use aliases. Either way, it’s all out there. 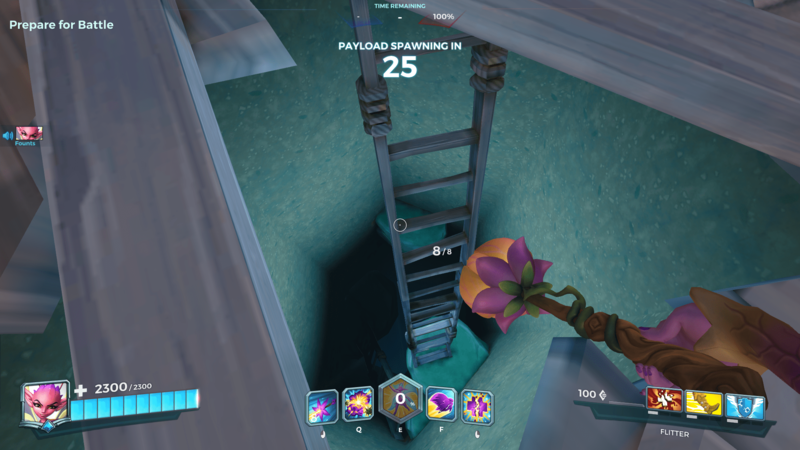 You can’t go down there. I wish you could. Paladins seems to use ELO as a ranking system and I am very familiar with ELO through League of Legends – which arguably is the “best” (most successful?) MOBA out there, and back when I did play seemed to be the shining light of how to do Free 2 Play. Bonus is that it also makes a ton of money. ELO is a grind – lose a match? -12 rating. Win a Match? +13. Because of the closeness of proximity of the scores (typically between 12 and 19) and with base ELOs around 1500 you quickly learn that it is a very long haul to climb the ladder. I actually agree with this system because it smooths out disconnects and general poor teammates/afk’s, etc. Sure, you might get a troll but chances are they are ranked low, so you only lose 12 rating. Next game, with the fully competent team you gain 15. I have played 25 “ranked” matches and have had a troll/purposely incompetent player/afk exactly one time. If it sticks to a 4% rate then this game will be spectacular. Using those small increments getting into the top tiers (4500 ELO) is in the hundreds of games – heck, the top two players have well over 1000 games played. I love that there is a third party website, Paladins.guru, that tracks all of this. I am a bit confused because in game they have a competitive rating instead. Now I am not sure if ELO is thier system or that websites. I wish there was more clarity. Either way my point is how many people are arguing about the outliers of games that is “ruining” their ranking. The truth about ELO is that it works, and you are placed in the correct ranking when you win/lose 50% of your games. That is great balance. What players tend to forget is that if you are routinely seeing a specific type of player at a general skill level that means you are home. People do not like the ELO system because everyone thinks they are better than their results show they really are. I am not telling you anything new here at all, am I? I didn’t mean for that comment to come off as passive/aggressive or anything, but trying to illustrate facts to people when emotion are removed from it all. The other, frequent commonality I see on the boards are with nerfs “Thanks DEVELOPER for dropping my damage by 2% This means I am TRASH and now I am QUITTING!” To these I normally get this kind of responses. I end up having to say this alot. Repetitively. it’s a common misconception that nerfing one character is bad for the game. It is good, it makes it more fun for everyone else who is sick and tired of facing the same overpowered champion again and again. If you are that good with that champion, it might be for a reason (other than you are an elite, master gamer at 1200 ELO). 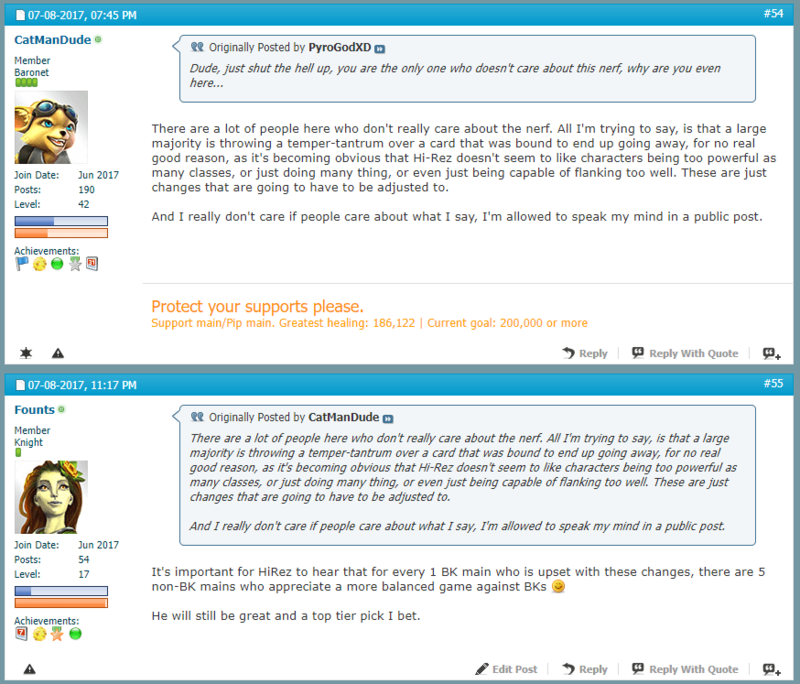 Needless to say I have been down this road before (ie: every other forums I have participated on in one way or anvother since the late 90s) but this time it feels a bit different. Like I am a wise, old soothsayer dispensing emotionless truth to the needed masses. Or something far less modest and it’s just a Zen like way to kill time. An out of game grind. I care about my results in ranked (which is where you are supposed to try) but am absolutely getting killed in Casual play for two reasons. First is because I have decided I am going to play every champion to level 6. That takes about three hours of play. Some champions I am just terrible at, so that makes it a long three hours. Still, I do improve but some I just don’t gel with well and once I get to 6 may never play again. The second reason is because few people want to play Front Line and Support, when I am not playing those (which I prefer) it usually means we have a poor team composition. Which makes playing the other roles I am already not that great at that much harder. This game absolutely destroys Overwatch in terms of flavor, strategy, champion design, in game skill adjustment, builds (etc.). I don’t even understand how OW is still in business when you compare the two. It’s like Vanilla ice cream (OW) vs a full banana split with three kinds of ice creams, chocolate and caramel sauce smothered all over it, and cashews, chocolate chops, and little pieces of peanut butter cups on top. There is no comparison from the amount I have played of each. I hope it has a strong, bright future. My posting on the forums will no doubt support that. Vanilla ice cream is the most popular ice cream in the world for a reason: it’s the best. Not a metaphor – there is just no flavor of ice cream that tastes better than vanilla! haha I was WAITING for the wise metaphor. Guess it’s not coming =) It DOES taste good, but it’s just very boring. Overwatch has some tight gunplay but is balanced for competitive Esports so they keep variables out of it. You know, all the interesting stuff on top of the goodness. You’re in deep! I hope you’re still having fun. oh yeah =) I always try to bring a sense of numbers and removing emotion from the discussions (ie: a player gets stomped by a certain champion so they must be OP, they lose so their favourite one needs a buff) and there are enough resources out there to see averages of millions of matches – so i just focus on staying calm and giving facts where I can. I haven’t played Overwatch and I may like it if I was to play, but after watching OW and playing Paladins, I think I’d prefer Paladins. And that comment about the walking potatoes was great! It’s amazing the amount of people that will blame others for their lack of success in an online game. I played OW and its shallow and hallow in comparison – but the shooting mechanics and polish is top notch.